I like to make dosas for breakfast, mainly because half of the work is done when batter is prepared on the previous day. So I am always in search for these dosa recipes. Recently I tried this recipe and we both loved it. 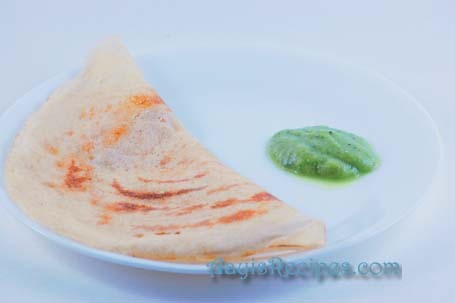 There are many different recipes for paper dosa, which is basically dosa which is thin like paper and very crispy. Usually in restaurants, they use a big tava and make a huge paper dosa. But since I have a small tava, I could not make it so huge. My aayi has a diary in which she has been writing recipes for many years now. Instead of stealing her diary, I copy as many recipes as possible. This is one such recipe I had copied from her book. We both enjoyed it a lot. The dosa was very thin and crispy. It is a bit difficult to remove first few dosas from tava. But once tava comes to proper temperature, they come out well.Â I served this with Richa’s Zuke-A-mole which was a perfect combination. Soak both rices, urad dal and fenugreek seeds for about 4-5 hrs. Grind it to a smooth batter. Add rice flour, salt, mix well and leave for overnight. Make the batter thinner than normal dosa batter. Next day make thin dosas. Crispy dosas are my fav too…but i dont add rice flour. I make the batter very thin and make dosas in non stick pan. your chutney colour is awesome. looks so yummy. White and green combo is perfect. Ur dosa looks sooo good! Shilpa..u r back wt dosas..this one looks yum n the dip too looks great! Wonderful dosa. Really whoever makes good idli n dosa I keep praising them :D. u know why??? bcoz so far I cudnt make them in gud way. everytime I try some or other way it becomes so bad than I myself not able to eat. now I am so scared of trying these two. Shilpa: Bhawana, are you saying the problem is due to fermentation? If yes, try taking the batter in a steel vessel and while cooking food, keep it near stove where the heat from the burner reaches it(not directly on the burner, for example, if you have a 4 burner stove, you have enough free space between the burners, keep the vessel in this free space). This way the vessel keeps getting heat till cooking is done and it ferments well. will they be crisp even if they don’t ferment? ‘cos i can’t ferment anything. Shilpa: Bee, I have the same problem here. I would suggest you to use the same method I mentioned in previous comment and it comes out very well. I think this one is easy to ferment and with a little fermentation, they crisp. I am not sure if they will crisp without any fermentation :(. this dosa looks good. we eat a lot of dosas.so I will try this. you are amazing….how do you find the time to make dosas for breakfast everyday…..i hardly have time to do anything else in the morning. but then i have never even tried making dosas at home. I get soft idlis and dosas even during winter. I grind the batter around 4 pm, and take it in a steel vessel, cover it and keep it in the oven with the light on. It double’s in volume by 7 am next day. Shilpa: Aruna, this oven method does not work if you have a gas oven(Bee has gas oven). I use this oven method for idli batter, but I feel for dosa batter, this stove top method is enough(we are having very cold nights here these days, but the method still works). I dont think this is paper dosa because your dosa is resembling something like sponge dosa.Paper dosa is very thin layered,long and very very crispy.The dosa is a famous dish of Andhra and it will taste good when served with Ginger chutney and Coconut chutney. Shilpa: Sindhura, this was very thin like paper and very crispy. To make it long, we need big tava, which I don’t have. So I made it small. There are many varieties of paper dosas as I mentioned above, and this is just one of them. it doesn’t look like paper dosa. 1) The dough, may be kept in the oven overnight, with pilot lamp on; to give uniform higher temp. than in most US homes (which are temp. controlled and particularly during cold season). The dough puffs up……and hence a larger vessel needs to be used. 2) If you are using a clean Tawa; light gas and drop a few drops of oil on the tawa and after a few seconds, wipe clean the tawa with paper napkin…………….leaving a thin layer of oil on the tawa. This helps using the dosas immdly. After a 3/4 dosa; sprinkle cold water on the tawa or better still; hold it under tap water to cool down the tawa marginally. Too hot tawa burns the dosas. You may repeat oil treatment again. goes very well with such dosas. One can never say no for such a lovely dosa shilpa!.. I am so happy to a dosa recipe after soooo long. While all your dishes are great most of them my family probably wont appreciate but give them different dosas and they r sooo happy. Will try this tomorrow. flattened rice to make crispy dosa. Shilpa: Since boiled rice(which gives a very good taste) is used, dosas stick to tava. So rice flour makes then come out easily from tava. sigh… I can’t make a decent Dosa… I am totally incapable of making dosas, luckily Siv has some talent in that department… Yours look perfectly thin and crispy, I am jealous Shilpa! Great recipe. looks and tastes great! What a great recipe! I am going to try it tomorrow. I think using the parboiled rice (ukde tandul) is what makes the dosa stick to the pan. My mother always said that ukde tandul are used for making idli and regular rice for making dosas. Thanks for the recipe though. Looks so yummy! Being a thin crepe, Dosa does not require fermentation, for the same reason Naan’s and Rotis require fermentation, but chappatis and parathas don’t. In all these foods, fermentation is used to make a thick foodstuff spongy. A thin crepe like a dosa or a flatbread like a chapati need not be spongy and so do not require fermentation. However, in most places the same dosa batter is used for making Idli and Uttapams. Idli and Uttappams being thick, need to be spongy. So this comon batter is normally fermented. Fermentation also gives a sour taste which a non- fermented batter lacks. In my experience a non fermented batter gives crispier dosas. Instant dosas when the dosa craving strikes! Shilpa: Ramki, in my experience, I have found that when urad dal based dosas are made and they are not fermented well, the dosas become chewy. You say one cup rice – What rice r u referring to. Shilpa: You can use any kind of white rice. What is the purpose of fenugreek seeds in dosa mix? Shilpa: Usually it is believed that urad dal creates gastric problem. So fenugreek is added to over come this. It is very nice of you to reply my question. Thanks a lot. Your receipe looks very temptimg , I would try soon and give my comments. hi ! great recipe, thanks ! just one quick question – is the boiled rice really means cooked rice or is it parboiled rice sold at regular indian stores ? Is the rice flour is made of sona masoori rice? By mistake i added 2 cups of boiled rice. Will it work. Do I add water to make the batter thiner. When do i add water , right before cooking or overnight. Shilpa; I think it will stick to tava when more boiled rice is added. hi shilpa,very glad to see ur recipes.all seem to be very yummy.will try soon and let u know.can u pls send me the recipe of appam and neer dosa. I just made these – well, over the last few days I “made” them. The fermentation came out great even though I’m in a cool climate but perhaps I added a probiotic (acidophilus) capsule to the mix. They tasted great, they caramelized at the edges and even crisped up nicely but they were not smooth/fine enough. I ground the rice and then the urad dal as finely as possible in my Cuisinart processor. I fermented the mixture for over 24 hours and it doubled in volume but there were still little chewy bits of either rice or dal in the batter. Any tips? Thank you!